Premier StakCut 724 24" cut paper trimmer delivers straight, clean cuts using a precision-angle steel blade. Cuts paper, matte board, cardboard, film, tissue, and textiles. Premier StakCut 724 24" cut paper trimmer delivers straight, clean cuts using a precision-angle steel blade. Its 24" cutting length blade accurately cuts paper, matte board, cardboard, film, tissue, and textiles. Permanent 1/2" measuring grid (English imperial and metric) provides a useful measuring guide that won't wear out like painted grids. Premier StakCut 724 paper trimmer features a finger guard that protects the the user from the entire blade length. A torsion spring prevents the blade from accidentally falling for increased safety. Patented automatic blade latch locks with every cutting motion for added control. Able to cut 30 sheets at once to save time on trimming. Versatile dual scale rulers in English imperial (inches) and metric system ensure proper alignment. 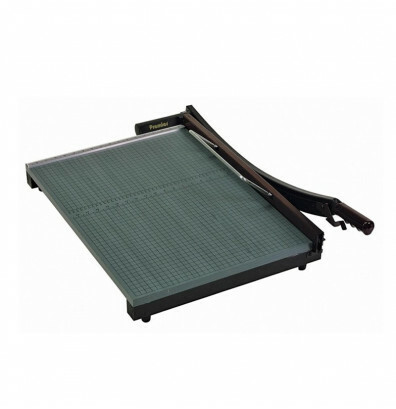 The 724 paper cutter offers an ergonomic soft-grip handle that provides comfortable use. Hand operated clamp holds items securely for accurate cutting. Non-skid rubber feet keep base from slipping on surfaces. Durable 3/4" thick wood base for long-lasting use. Hand operated paper clamp secures material for accurate cuts. 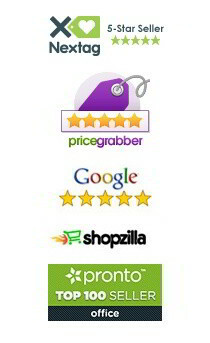 It is the exact product that we needed, price was right and shipped quickly. Very happy with purchase and would buy from again. It's a great Product, made very well, im very happy.